Today is the second of September. Most school age children are back in school. Labor day is this weekend. Summer is almost over for most of us. NO! Say it isn’t so! We all hate for summer to end. Well, most of us hate for summer to end. If you live in central Texas where temperatures have been in excess of 100 degrees lately, you probably are saying good riddance. Nonetheless, we are all looking for ways to cling to summer. And I have the perfect solution: S’mores Tarts. The summer favorite, S’mores, is being brought indoors to enjoy year-round. This is a somewhat original recipe. The base of the chocolate pie was borrowed from Juanita Braxton, a long time baker of Southern Alamance County (where I grew up), well known for her accomplishments in the kitchen. This is rich, decadent comfort food. You need to keep them refrigerated once they cool, or you can put them in the freezer. Just wait to put the marshmallow on right before you heat them. And always serve them freshly heated. I hope that you like them. It’s chocolate, what’s not to like? You will need 3-inch aluminum tart pans for this recipe, as pictured below. These can be purchased online or at baking specialty stores. I personally use Web Restaurant Store. Combine dry ingredients into mixing bowl. Melt the butter and add to the dry ingredients. Mix with your fingers. Distribute crumbled mixture evenly between the tart pans and press firmly against the sides and bottom. Place tins on baking sheets, or else transport will be difficult to impossible. Bake in a 350-degree oven for 5 minutes. Note the baking process tends to make them loose their shape. 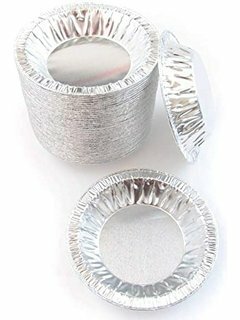 I keep and extra tin on hand and press it into those shells that lose their shape as soon as they come out of the oven. Beat the eggs and set aside. Combine all of the dry ingredients in a mixing bowl and mix thoroughly to combine evenly. Add the eggs and the remaining ingredients while mixing at medium low speed, either in a blender or by hand. Make sure to add your melted butter at room temperature so that it doesn’t cook the egg mixture. Once all ingredients are added, continue to mix on medium for 1-2 minutes. Mixture should be smooth and without lumps. Pour chocolate mixture into tart pans. Pour as close to the top as possible without spilling over. The mixture will puff slightly, but will not increase in volume. Bake on cookie sheet for around 20 minutes in your 300-degree oven. Tarts should not be jiggly in the middle. Remove from oven. While still warm place 2 squares of Hershey chocolate on each tart. Set aside, until ready to serve. If you are making these a day ahead of time, these tarts should be refrigerated until you are ready for the final step. 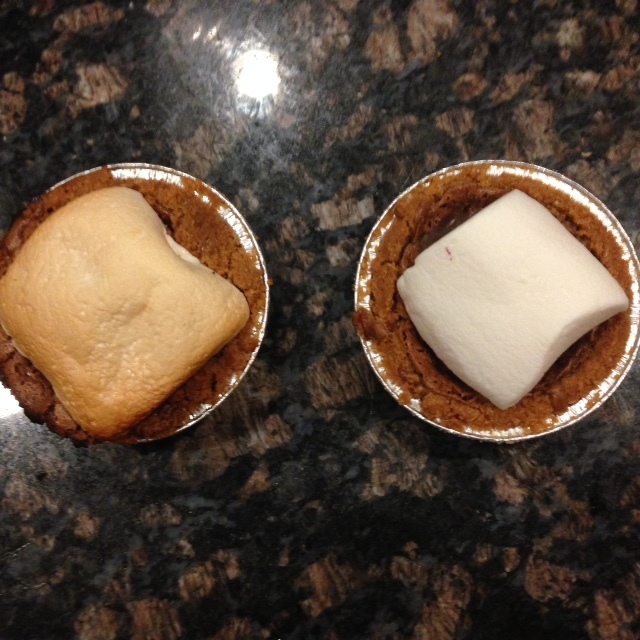 Slice a Jumbo Marshmallow in half and place 1 piece on top of the tarts. Now you need to heat them until the marshmallow turns lightly brown. This step can be done in a 400-degree oven on bake, or it can be done on your outdoor grill. These are best when consumed warm. Enjoy, and have a great campfire-optional Labor Day weekend! These are so tasty! They are a huge hit with adults and children.